Image reproduced by permission of Dr. Ram Devanathan and The Royal Society of Chemistry from Energy Environ. Sci., 2010, 3, 1406-1426, DOI: 10.1039/C0EE00028K. Results: No, Heidi Klum and Naomi Campbell have not taken up new careers. The models in this case are computer models designed to address specific situations for scientists designing the next generation of nuclear fuel and power plants. Unfortunately, the computer models are rather inept at communicating with each other. Now, an international team of scientists led by Dr. Ram Devanathan of Pacific Northwest National Laboratory has highlighted a hierarchical scheme that allows the models to share information. In this approach, each model passes its findings to the model dealing with the next largest scale; that is, the model dealing with atoms passes its information to the microscale model, so the microscale model can include fundamental physics and chemistry. 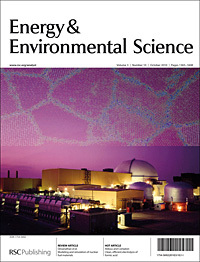 The team's approach is described in an invited article in Energy & Environmental Science, October 2010. Artwork highlighting the research graces the cover of this high-impact journal. Why It Matters: Around the world, scientists and engineers are interested in new designs for nuclear reactors that wring more energy from the fuel to meet rising demands for abundant energy and minimal carbon dioxide emissions. When used with experimental validation, the team's hierarchical approach provides an integrated computer model to examine the behavior of potential fuels on different scales, from atoms to meters, and from nanoseconds to years. This provides a more holistic view of new nuclear fuel and new reactor designs. "Our computers are getting faster, and our models are getting better through research," said Devanathan. "So, there is a lot of hope for this kind of approach, where you can design and test how a reactor responds. Even before you install the reactor, you could simulate the system and know what's going to happen under different operating scenarios." Methods: At a scientific conference last year, a group began talking about the challenges of modeling materials in nuclear reactors. The problem is that events at the atomic scale, which occur in a nanosecond, can greatly influence events that occur the meter scale over the course of several years. The computer models provide answers for the different length and time scales. One model might provide answers on interactions that occur between several atoms in a nanosecond. Another might show what happens to an entire fuel rod over several years. "What you've got is different models that cover different regimes," said Devanathan, who was part of the original discussions. "What you need is the models to talk to each other—to pass information between the regimes in reliable ways." So, by the end of the conference, the group committed to using their respective expertise to illustrate a way for the models to communicate with each other. In less than 10 months, they assembled their findings into a hierarchical modeling scheme. What's Next: Integrating and validating the models are important steps on a longer journey to ultimately build physics- and chemistry-based models for use in designing and licensing nuclear power plants. Acknowledgments: This work was funded by the U.S. Department of Energy Nuclear Energy Advanced Modeling and Simulation program, the Laboratory Directed Research and Development program at Sandia National Laboratories, and the European Commission under the FP7 F-BRIDGE project. This study was authored by Ram Devanathan of Pacific Northwest National Laboratory; Laurent Van Brutzel, Alain Chartier, and Christine Gueneau of CEA, Department of Physical Chemistry in France; Ann E. Mattsson, Veena Tikare, and Timothy Bartel of Sandia National Laboratories; Theodore Besmann of Oak Ridge National Laboratory; Marius Stan of Los Alamos National Laboratory; and Paul Van Uffelen of the Institute for Transuranium Elements in Germany. Reference: Devanathan R, L Van Brutzel, A Chartier, C Gueneau, AE Mattsson, V Tikare, T Bartel, T Besmann, M Stan and P Van Uffelen. 2010. “Modeling and Simulation of Nuclear Fuel Materials.” Energy & Environmental Science 3(10):1406-1426.